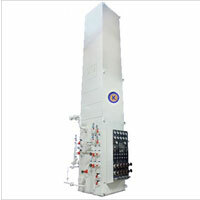 KVK plants incorporate design features, which enable industrial oxygen gas plant to produce high quality nitrogen gas simultaneously with oxygen gas generator. This results in higher economical viability. 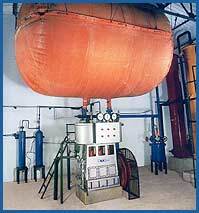 plants are equipped with a highly efficient Expansion Engine, which helps rapid and adequate cooling. On account of this KVK plant operation is exceedingly stable with a consistency in gas purity. High standard of purity of gases. Fool proof temperature indicating system-electronic scanner. International class pressure differential gauges are foolproof liquid level indicators with stainless steel control panel. High quality insulation by Perlite power to prevent cold losses. Single pump for filling Oxygen as well as Nitrogen. Heavy duty air compressor (4 stage) suitable to operate with the power supplied by a diesel generating set or normal power supply of 415/440 V-50 cycle. An industrial refrigerator (chilling plant) with air-cooling facility both before and after the drier battery is included in our scope of supply. Plants layout, foundation drawings for easy and economical installation. On line oxygen purity analyzer. Liquid Pumps are with non-lubricated cross head and therefore are hazard free for Oxygen pumping. Facility for PPM grade of dry Nitrogen Gas. Minimum percentage of Oxygen is lost through waste Nitrogen to achieve optimum production. Atmospheric Air mainly consists of Oxygen and Nitrogen gases along with small quantities of water vapour, Carbon Dioxide, Argon, Helium, etc. Oxygen and Nitrogen from the Air are separated due to difference in boiling points by distillation through a fractional column. Atmospheric Air is sucked in by a multi stage Compressor through a filter and is compressed to the design pressure. The compressed Air is then passed through inter-coolers, Industrial Refrigerator, Moisture Separators, and then to the Molecular Sieve Battery for removal of Carbon Dioxide, Hydrocarbons and Moisture from the process Air. This pure Air then passes through the 1st Heat Exchanger, where it is cooled by the out going Nitrogen and Oxygen. Part of this cooled Air is passed through Expansion Engine and the other part through the 2nd Heat Exchanger. Both the Expansion Engine and 2nd Heat Exchanger help in further cooling down the Air, which is finally released to the bottom of the column through an expansion valve. The Air becomes liquid at this stage. The column consists of two parts. The lower column and upper column. In between the lower and upper columns there is a condenser, which acts as a reflux for the lower column and as a re-boiler for the upper column. The liquid Air at the bottom of lower column separates through the trays to give crude Oxygen at the bottom and approximately 90% pure Nitrogen at the top. Crude Oxygen termed as rich liquid is then expanded through an Expansion Valve from the lower column to the middle of the upper column. Crude Nitrogen termed as poor liquid is expanded through another Expansion Valve from the top of the lower column to the top of the upper column. Due to difference in the boiling points, the pure Nitrogen boils over and accumulates at the top of the upper column and Oxygen, which accumulates at the bottom of the upper column. 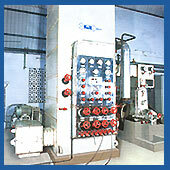 Both Nitrogen and Oxygen are removed through separate paths in Heat Exchangers, for cooling the incoming air. Oxygen is compressed to a prescribed settled pressure by a liquid pump and is directly filled into cylinders. Nitrogen is however available at a pressure of approximately O.5kg/cm2 and the same can be compressed into cylinders with help of an independent high- pressure compressor.